SKU: ECVblgri11cm$195. Categories: Current Work, Featured, Vases. Stunning overlapping colours and luxurious tones combine elegance and pure design. The stylish Eclipse Collection displays movement and colour framed by lead-free, crystal clear glass. The Eclipse Vases captures the colours of the vivid countryside, contrasting from vibrant ruby red and burnt orange to soft tones of the sunrise and the blue and green shades of the rain forests and clear waters. 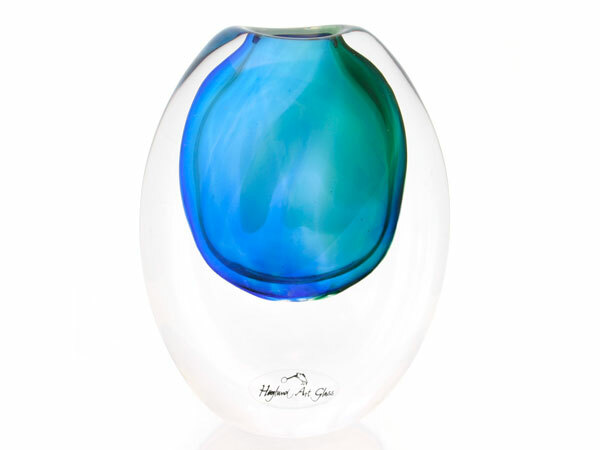 Each vase in the Eclipse Collection is individual and slightly different from the next one, making each one unique.